March 18th, 2011- Thank you. I’ll take your note as a sincere compliment, but are you drinking already? Thank you. 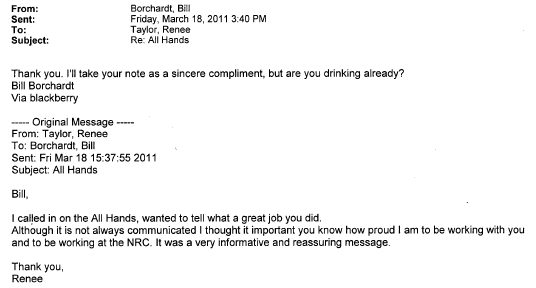 I’ll take your note as a sincere compliment, but are you drinking already? I called in on the All Hands, wanted to tell what a great job you did. Although it is not always communicated I thought it important you know how proud I am to be working with you and to be working at the NRC. It was a very informative and reassuring message.